Ever wondered what the median rent is in every Brooklyn and Manhattan neighborhood? It might make you think about buying a place and maybe down the road to rent it out…...bit.ly/1F3ISve. Listings website Zumper has once again worked its magic to take the rental data from April, in which rents continued to rise citywide (surprise!) 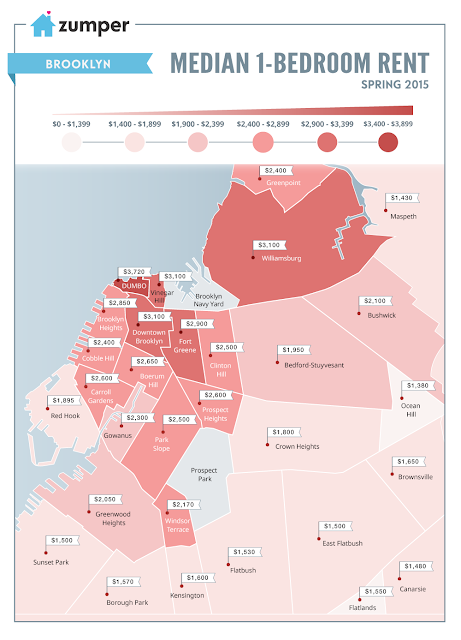 and Brooklyn reached a new plateau, and put the median rent for each neighborhood into easily digestible map form. Though perhaps digestible is the wrong word, since a lot of these rents may very well turn your stomach. NoMad/Flatiron, for instance, leads the pack with the median price of a one-bedroom sitting at $4,490. Tribeca is still up there, too, at $4,450. The West Village, surprisingly, fell to $3,700. In Brooklyn, Dumbo is still the leader at $3,720. Click my picture for more information about me. Looking for a loft close to the famous upcoming Hudson Yards??? What Exactly is a Property Tax Abatement? Already leased - in less than a week!!!! Gorgeous Views over the Hudson River - Now for lease!!! !